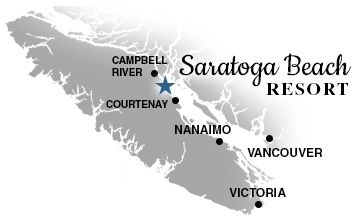 We hope you will have a restful vacation and enjoy both our Resort and the Comox Valley. Check out time is 10 am, check in time is 2 pm. Only ONE vehicle plus RV is permitted in each site. Parking passes will be issued at check in, space is limited. The speed limit for bikes and vehicles is 5 mph in campground. Quiet time is between 11 pm and 8 am. No loud music any time. Pets must be on a leash at ALL times and be cleaned up after on the property, beach and neighborhood. Campfires at the communal pit site are permitted at any time as long as wind is not blowing smoke into campground, or when there is not a fire ban in effect. No washing vehicles allowed – we’re on metered water. All garbage must be placed in garbage dumpster at front roadside, in tied plastic bags, please. Recycling bins for refundable containers only. Please respect the privacy of all fellow campers and do not cut through campsites. Saratoga Beach Resort cannot accept the.responsibility for vehicles or property brought to the resort. Please secure all personal property, valuables should be locked in vehicles when possible, locks should be on bikes etc. We are on septic tank systems – please don’t put harsh cleaners, foreign objects down drains – this results in blockage and a shutdown of the system. The foregoing are in place to assist in the enjoyment of the grounds by all our guests. Ask the Management for help at any time.